Home Community Who is Maya Wright? A ‘Jeopardy’ winner! 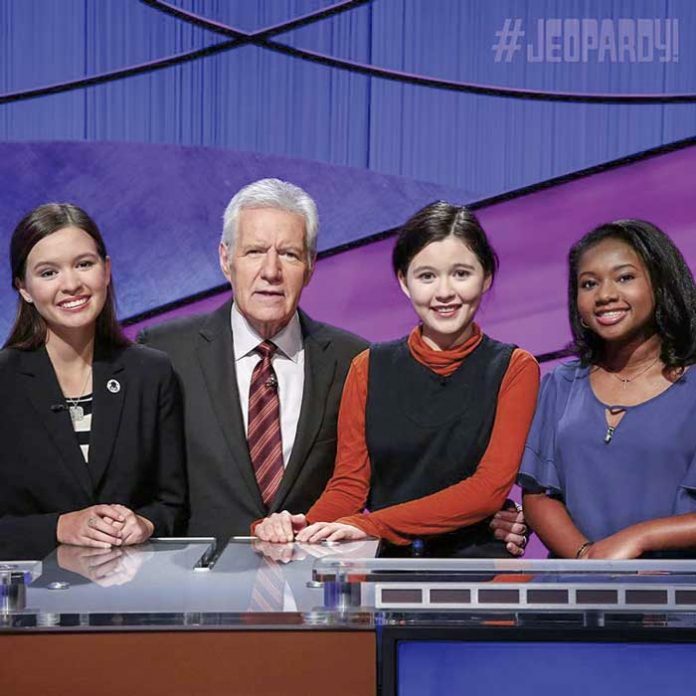 Maya Wright, far right, with her two opponents in the finals of the “Jeopardy!” Teen Tournament along with host Alex Trebek. Photo/Jeopardy.com. This East Coweta High School senior recently parlayed her exceptional intellect into a big payday and a co-starring role in front of a national television audience. OK, so that wasn’t exactly original. But it’s likely similar to what Wright herself has heard repeatedly over the past three weeks since her initial appearance in this year’s “Jeopardy!” Teen Tournament. For those who are familiar with the show but not the unique format of the tournament, it is a two-week event featuring 15 contestants. The five episodes during the first week produce nine semifinalists (the winners of each episode plus the four highest scores from among the others). Three more episodes whittle the field to three finalists, who compete in a two-day game that sees the winner receive $100,000. Wright appeared in the first episode of the entire tournament, which aired Nov. 7. She won that day and also was a big winner in her Nov. 15 semifinal game, where she built such a big lead over her two challengers that the Final Jeopardy round was irrelevant. Since she was one of the first three contestants on the soundstage, she didn’t really have time to get nervous. By winning that game, Wright didn’t have to sit through the next four games to see if she qualified for the semifinals. In each of the first two rounds she was able to amass big scores in part because of favorable categories. In an all-female final, Wright managed a third-place finish. But that was good enough for a $25,000 payday — “pre-tax,” as she astutely pointed out. The adventure began in April when Wright took the online test along with thousands of other hopeful teens. She received an email several weeks later notifying her that her test score was high enough to earn an in-person audition — if she could travel to one of the audition sites. The closest such location was New Orleans, so she went there in June and tried out with 30 or so others. At this point there were about 150 in the running for the final 15 slots. Unlike the regular version of the show, where qualifying contestants have to make the trip on their own dime, a Teen Tournament appearance meant an all-expenses-paid trip to Hollywood. Since Wright was under 18 years of age, the show also picked up the tab for one of her parents to accompany her. The Wrights decided to make it a family affair, getting two extra plane tickets so both parents and Maya’s younger brother could go. The trip was even more exciting for her fourth-grade brother, who had never been on an airplane before. The family stayed at a luxury hotel next to Universal Studios Hollywood. The only contestant from Georgia, Wright met fellow brainy students from all corners of the United States. New relationships were formed, and thanks to technology and social media they are being sustained. Regular viewers of “Jeopardy!” know that a short break is taken during each game for host Alex Trebek to chat with the contestants and learn more about them. The contestants fill out cards before the game to prompt Trebek in those conversations. People who watched the Teen Tournament learned that Wright is named for Maya Angelou, likes to collect books, and is multilingual. She speaks four languages (English, Spanish, French and Catalan) and reads two more (Italian and Portuguese). “Linguistics is something that just really interests me, and I study it because I want to,” she said, adding that she is looking forward to travels in future years that will allow her to utilize those skills. Because contestants are not allowed to divulge the outcome before a show airs, Wright and her family had to keep their lips sealed for three months. She was able to include her experience on some college applications but only the fact that she was a contestant, with no detail about how she finished. She is not waiting to see what her college options are and hopes to learn in the coming weeks whether she is accepted at her first college choice, Emory University. With a desire to someday work in the health care industry, her major will likely be in the medical field or a science such as biology. Wright ranks 16th academically in a senior class of about 600 students at East Coweta. Her extracurricular pursuits include Academic Bowl, Science Olympiad, National Honor Society and National Spanish Honor Society. Her family lives in Peachtree City but she attends school west of the county line because her mother is a middle school teacher in the Coweta district. Since “Jeopardy!” on television is showing no signs of waning popularity any time soon, Maya Wright can enjoy her 15 minutes of fame in her community as the months wind down until graduation. After that, she will have a special memory that literally lasts a lifetime.